Cleaning out a family members farm I discovered and old TV cabinet on the burn pile. I grabbed it off the pile took it home and restored the cabinet to it original beautiful condition. I made all new legs from bits and pieces of the original legs. The speaker grill was missing, I found a website the had original cloth available. The medal frame around the tube was shattered so I carefully reassembles and body worked it back to what it once was then painted with a new high luster gold spray paint I found at WalMart. Matching the stain was tricky, the Woodsmith Store in town was able mix stains to get really close to it original color. I was going to mount a flat screen inside but gave up on that when I could not find a flat screen anywhere close to the size I need. So I decided to print out an old copy of the “test screen” we all use to see when stations were off the air. It’s now a nice conversation piece in the game room! Looks cool. I was thinking the same thing…....a flat screen computer monitor or TV but I can imagine the correct size would be difficult to find. Boy does that ever bring back memories. 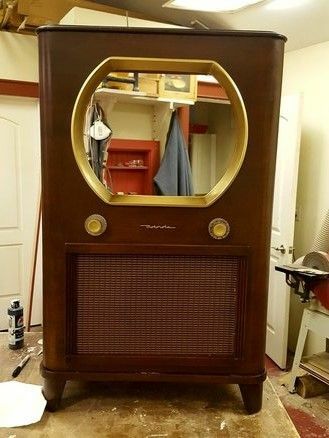 My Dad had a tv shop back in the day. My job was to clean the insides of the glass and check all the tubes. How I remember that test pattern as a kid. I always liked that Indian head test pattern. The test pattern was the only thing that ever came in clear when I was young! It would be cool if you could make it into a Bluetooth speaker. Either way, nice job sir! Great restoration! I remember when color first came out way back in 1954; I was just a little guy back then. I even remember when…(I think it was the Ed Sullivan Show) That asked their views to set up a radio on the left side of their TV sets and tune in into a specific station. Then (on TV) they set up two microphones one on each side or the stage. One side of the ocraster would come out of the TV and the other would come out of the radio to simulate Stereo. I think I was about 10 or 11 at the time. Anyway nice seeing this restored TV of yours! Nice work! You did a nice job on this old piece. Beautiful job and it seem like I remember watching Flash Gorden one one of those. Boy this thing really brings back a lot of memories! While I was in high school and Jr college I worked in a TV and radio repair shop, I don’t know how many of these sets or test patterns I saw. I did service calls from 1960 to 1965 in the Midwest before cable TV took over and there were only three networks on the air, not all day/night back then. You even had the old round tube! You did a super job on that! Where did you get the ancient test pattern? Wow I remember these. My Aunt had a screen film with blue on top, yellow in the middle and green on the bottom. Simulated color. The only show that it look right on was Bonanza. Nice find and great restore job. I am taking your advice and mounting a Bluetooth speaker in the TV. That will make it a nice novilty in the game room. Thank for the hint!!! I was thinking about Steve’s latest project too, always like what he’s cooking up. Great restore and saved memory on past times. I like woodworking combined with technical/engineering projects.